You’re starting out (or in the market for a new starter grill) and you’re seeking something simple, efficient and inexpensive. 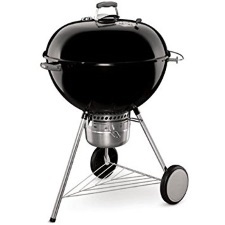 We present you the Weber 14401001 Original Kettle-Style Premium Charcoal Grill, 22-Inch, Black. With a nice 363 square inches of grill space, this is a grill with some respectable features. A heavy-duty lid that is porcelain-enameled, and a center bowl that is as durable as they come, this grill will be your backyard buddy for years, guaranteed. The thermometer is built-in to the inside of the grill which allows for easy heat monitoring, and the lid has a handy shield that keeps the heat away from your legs. A nice addition as any griller will tell you. Don’t you just love seeing these two words. We do, but only if it’s true. Nowadays many products will tell you they’re easy to clean where in reality just the opposite occurs. In the case of the Weber Premium Charcoal Grill, satisfied reviews attest to the veracity of this proclamation. What is known as the One-Touch cleaning system, the user rotates the handle and blades move ash and remnants into vents and down to an ash catcher below. The only things remaining in the bowl are unburned coals which can be obviously used later. The first step is making it easy to clean, and the next is easy to move and easy to grill. The heat shield is probably the best feature on this grill, keeping your legs safe from uncomfortable heat and other nasty things that can result from a BBQ that is not well-planned or executed. Second, this grill features aluminum legs that are easily adjustable to your ideal height plus two wheels which are quite durable and work excellently in all-weather. If there was ever a grill with your best intentions in mind, this is it! The Weber Premium Charcoal Grill has a 22-inch diameter bowl (porcelain-enameled), and a hinge less lid. Cooking grate is plated steel with 363 square inches of grill space. One-Touch cleaning system features a removable ash-catcher made of aluminum steel. Nylon handles are glass reinforced with hooks for tools, and the damper is aluminum and rust-resistant. This Weber 14401001 Premium Charcoal Grill received rave reviews – just over 1,133 Amazon reviews. Those who have bought and used the grill give it a 4.7 out of 5 stars with 5 and 4 Stars making up 92% of the ratings!